Scorpios are secretive, yet other people tend to tell them their own secrets. This often puts Scorpio in the role of counselor. Scorpios are slow to trust new people and it takes a long time for them to reveal just a few of their secrets or make themselves vulnerable in any way. Others are often intrigued but also frustrated by the Scorpio’s carefully constructed emotional defenses. The typical Scorpio has piercing eyes, a powerful gaze, and a magnetic and seductive personality. People tend to find Scorpios interesting because they reveal little but are usually very deep. Scorpios are also highly intuitive and good at solving mysteries and puzzles. They have a knack for figuring out what is going on behind the scenes in any given situation and a talent for discerning the feelings and motives of other people and predicting what their next moves will be. This ability can make them either very empathic and compassionate or cruel and vindictive, because they know where other people’s weak points are. 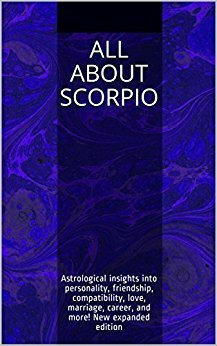 Known for their sharp minds and shrewd intellects, Scorpios like to explore the profound in life and have little interest in small talk. They tend to be excellent judges of character, and most have plenty of compassion for those who truly deserve it, but no sympathy or patience for whiners and people who are the authors of their own misfortunes. Scorpios can tolerate a lot of hardship and manage under the worst of conditions. They are good at overcoming obstacles and turning challenges to their advantage. Scorpios are extremely persistent, going after what they want with a fierce determination that is often rewarded. They are survivors, and adversity makes them stronger. Scorpios don’t like to show any weakness. They are cautious about what they show to the world due to their fear of others having power over them, and their need to be in control at all times can cause problems when they deal with authority figures. The sign of Scorpio rules over death, rebirth, and the occult, and Scorpios are often interested in these subjects. They have the courage to examine things that most people fear, and they are able to intellectually explore subjects such as death that others avoid. Scorpios can experience a lot of anxiety, but not usually over the things that make other people anxious. Most Scorpios are not squeamish, which fits them for careers in medicine and rescue operations. They are cool under pressure and almost always in control of themselves, which also makes them good spies. soldiers, and police officers. Scorpios are often suspicious of others, and many have a strong jealous streak or a tendency to attract very jealous partners, which can cause strife in their relationships. Scorpios can also be inflexible, resentful, and vindictive, unless their ascendants or moons are in gentler signs such as Libra or Pisces. Anyone who tries to dominate or harm a Scorpio will soon feel the sting. Scorpios can be vicious and vengeful. They are unforgiving and feel a need to take revenge when they or those they care about have been wronged. This means that Scorpios who lack a conscience can be exceptionally dangerous. However, most Scorpios have very well-developed consciences and are inclined to be harder on themselves than on others. Ultimately, Scorpios fall to one of two extremes: either they represent the height of integrity or the depth of diabolical cunning. Scorpios are extremists. Everything they do is all-or-nothing. They tend to be courageous, and if other elements in their natal zodiacs magnify their propensity for risk taking, they may develop an affinity for extreme sports. Although typical Scorpios are strong, courageous, and blessed with high endurance, they are inclined to be hypochondriacs or suffer from hard-to-diagnose symptoms when under stress. Extreme obsessions and compulsions are also common among Scorpios. Scorpios are fiercely protective of those who elicit their sympathy. They will sacrifice anything without hesitation (even to the point of risking their lives) to ensure the safety and happiness of those they care about. When other elements in Scorpios’ natal zodiacs incline them toward altruism, , the combination of a self-sacrificing nature and physical courage may draw them to rescuer careers such as police officer, fireman, coast guard, or paramedic. Self-employment suits the Scorpio personality because Scorpios don’t like to have anyone telling them what to do. They are hard workers on their own, however, and excellent researchers (this talent for research may extend to investigative ability). Unless their ascendants fall in more careless signs, Scorpios are responsible by nature, and can almost always be counted on to do what they say they’ll do. They don’t just talk idly; they put their plans into action, which is one of their great strengths. Typical Scorpios are practical, reliable, and good with money. They are also forceful and exhibit great willpower, which increases their likelihood of success in the long run. The sun sign isn’t the only element that influences personality. Aspects and planetary placements, particularly the moon sign and rising sign (ascendant), are also important. For example, a Scorpio with Aquarius rising will be more extroverted and less inclined toward jealousy, and with Gemini rising, a Scorpio will be more forgiving and open about deeper feelings, but less reliable and well-organized. There are many websites that offer free chart calculation to determine other planetary placements and aspects (for example, www.astro.com). Learning these other planetary placements is recommended, as it provides a more comprehensive personality profile. I was born in the month of november,what is my asthology element?